NASHVILLE- The Tennessee Bureau of Investigation overnight arrested two individuals in Rutherford County for planning to have one of their wife’s shot to death. Pratakkumer Patel (top photo), 31, of Gallatin was arrested at the Triple S Market in Gallatin on one count of conspiracy to commit first degree murder. Kalpesh Patel, 44, of Murfreesboro, was arrested at the Almaville Market in Rutherford County and charged with one count of conspiracy to commit first degree murder. The 16th Judicial District Attorney General requested TBI investigate the murder plot yesterday after receiving information that the two subjects had solicited a potential hitman to shoot Pratakkumer’s wife this morning. The two paid the hitman $15,000 cash and provided an address, vehicle description and photograph of the intended victim. The two subjects are reportedly cousins. Pratakkumer Patel was booked into the Rutherford County Jail on $100,000 bond. He posted bond, but remains in custody by immigration. 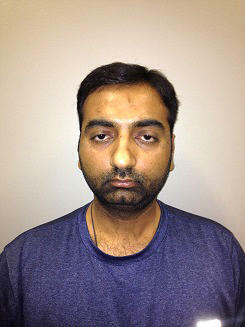 Kalpesh Patel was booked into the Rutherford County Jail on $130,000 bond and immigration has also placed a hold on him. He was currently out on bond on an identity theft charge out of Murfreesboro.